UNESCO and Ministry of Culture, Sports and Tourism of Viet Nam organised an international conference on World Heritage and Sustainable Development in the Contemporary context in Ha Long City, from 9 to 11 July 2018. Thirty years since the ratification of the UNESCO Convention concerning the Protection of the World Cultural and Natural Heritagein 1987, Viet Nam is confronting both opportunities and challenges related to significant increase in tourism, especially in World Heritage sites. During this period of time, the country transformed from one of the world’s poorest nations, to one of the most dynamic emerging middle-income countries in East Asia region. Nowadays, The involvement of (national and international) private sector in the tourism market is unprecedented, and is growing at a fast pace. To better protect its natural heritage, some sites, such as Ha Long Bay, have transformed their economic structure, closing mining and extraction activities, to favour a tourism industry that is supposed to be more environmentally friendly, but that often results not to be effectively sustainable. The conference gave the opportunity to examine current situation in the light of The 2030 Agendaand The Sustainable Development Goalsin order to better understanding the contributions of World Heritage sites in Viet Nam and neighbouring countries to such an agenda, with specific reference to poverty reduction and to real benefits to local communities. 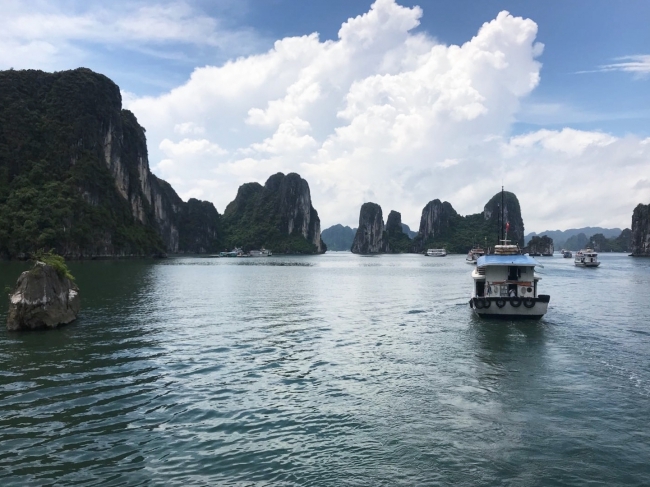 Over 100 participants including national policy makers, site managers, scholars and representatives of the private sector, together with UNESCO and IUCN experts, convened in Ha Long Bay to discuss the way forward. The event aimed to examining both good and negative practices in order to provide recommendations to enforce the protection and promotion of World Heritage for sustainable development. Anna-Paola Pola, from WHITR-AP Shanghai, participated bringing the experience of China in the revising of laws and heritage regulations, especially the ones related to traditional-ordinary architecture and landscape-based cultural values. The mission to Viet Nam was also an opportunity to visit and review the situation of some villages included in the Small Settlements Research WHITR-AP is conducting. To this purpose, on July 12, Anna-Paola Pola met Mr Pham Sinh Khanh, Deputy Director of Trang An Landscape Complex Management Board. Together they visited the site and its villages, recording the current situation, discussing the recent transformations of the villages and the upcoming sensitive challenges that should be addressed in the near future.